Some people think large bridges or other exceptional infrastructure is what draws people to this blog, but no, it’s the babies. 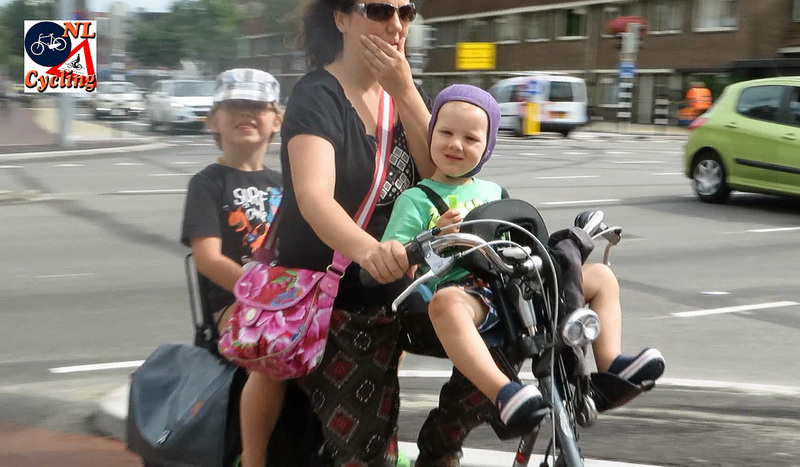 No really, the most viewed post is the one where I show how the Dutch ride with their babies and toddlers. I wrote that post almost two years ago, but it is still in the top three of most viewed posts almost every day. So let’s get into that topic some more! 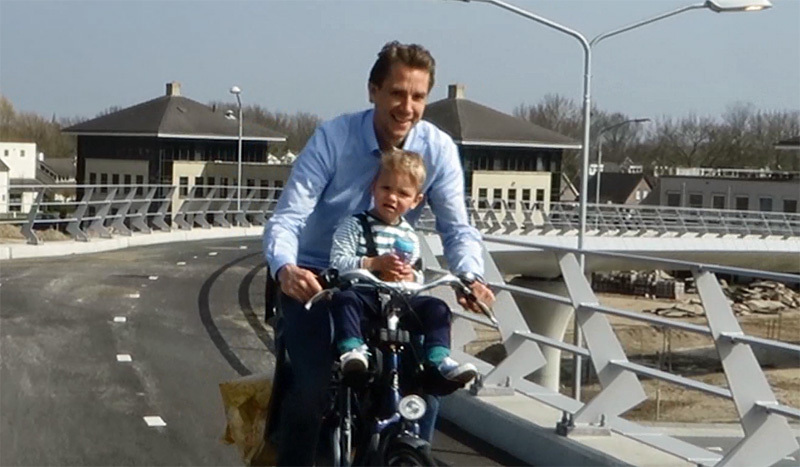 Proud Dutch father cycling with his son. Note the child is securely strapped to the seat. This stylish Dutch mother has done some errands and returns home with her son in the back seat. 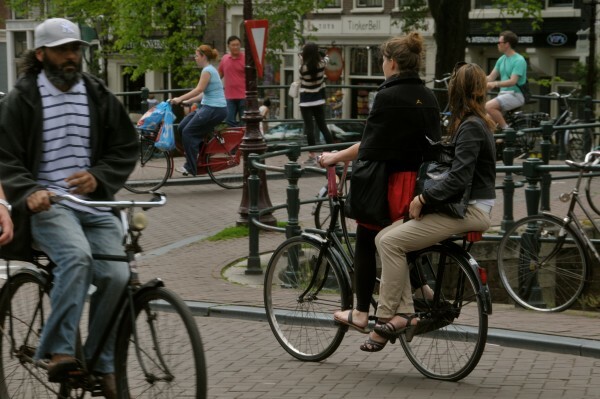 To the Dutch cycling is as natural as walking, so they cycle everywhere and for a myriad of reasons. That doesn’t change when the family expands. From the moment a baby can sit upright, special child-seats are attached to the bicycle of either mum or dad and off they go! When a second child arrives and is able to sit upright as well, it is usually around the time the first born is just becoming too big for the front seat, so places can be swapped. The eldest moves to the back seat and the front seat is taken by the youngest. This can change one more time about two years later, when the youngest is also too big for the front seat. At that time the front seat may be exchanged for an extra saddle on the frame. That is easy for the bicycles for men, but these additional saddles also exist for a bicycle without the horizontal tube. That extra saddle can then become the seat for the eldest and the youngest takes his or her former place at the back. Then again 2 years later the eldest can cycle on his or her own, and the youngest can take the extra saddle, until that child is also old enough to cycle by itself. This young child sits securely in her seat. The feet are protected well and a wind screen protects the child from the wind. The protective bar encased in soft foam protects the child from smashing against the steel handle bars of the bicycle. This mother rides with her two children. The one in the front is getting a bit big for the seat. A new solution to transport these two will have to be found soon! 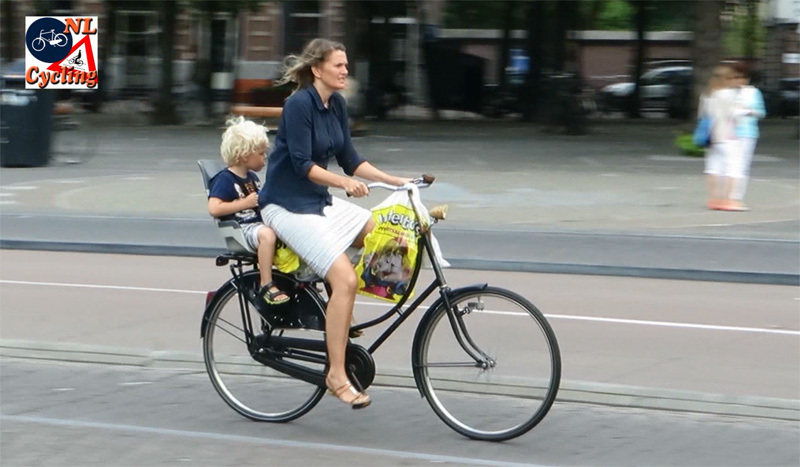 That is the full cycle of the bicycle arrangement for a typical Dutch family with two children. Many families cycle with their children. It is not something only a fringe group in society does. This is a fully accepted way of transporting young children, by every generation. That’s why you see so many grandparents cycling with their grandchildren as well! Few things are more attractive than riding with your child, seeing the wind in their hair and the excitement it gives them. As the video shows, a lot of trips are for transport (especially with the mothers) and many trips are for leisure (especially with the fathers). It is also interesting to see that a lot of grandfathers cycle with their grandchildren, but fewer grandmothers. What the reason for that might be I cannot begin to imagine. A grandfather cycling with a very young child. The bicycle is a model for women. It would seem the man uses the bicycle of the mother of the child for a nice ride. He may have done some errands too. There’s stuff in the front basket. Some observers from a different background look at this habit in shock and awe, especially when they see the bare heads of all these children. But that is not where the danger lures in transporting your children like this. The body parts that are injured most are the feet. A safety board estimates that about 2,300 children per year need medical treatment after their feet were injured, because they got entangled in the spokes. This may sound like an awful lot, but you have to consider that of the 14 million bicycle trips per day in this country, many are made with children as passengers. A third of these injuries are just minor scratches and bruises and 15 years ago the number was closer to 5,000 injuries. So the number of injuries has dropped dramatically; 37% in the period 2009-2013 alone. It has been mandatory to have feet protection on new children’s seats since 2004. Apparently the older second hand seats without this protection are finally being used less and less. Left: a front seat. Note the straps to secure the child and also its feet. The weight of the child is on the handle bars so the child cannot be too big and heavy. Right: a back seat. These seats are larger and can be used for larger and heavier children. Note the extensive protection around the feet, so the feet cannot be harmed by the spokes of the back wheel. Other solutions to carry a child. Left: extra saddle for a man’s bike, centre: an extra saddle for a woman’s bike. Right: a simple back seat to carry two children. 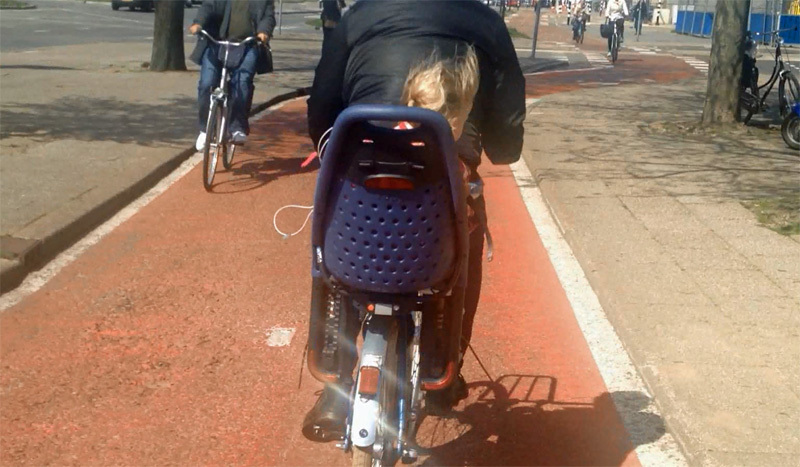 With the modern seats there is really nothing that stands in the way of transporting their babies and toddlers safely on a bicycle for most of the Dutch. The children are also very happy on the bicycles and it shows. This girl shows what it means to cycle with the wind in your hair at the back of daddy’s bicycle. My video for this week shows a lot of happy children on their (grand)parents’ bicycles. For more factual information about how, why and when the Dutch ride with their small children I’d advise you to read the earlier blog post as well. 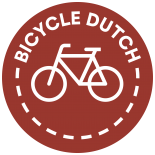 The Dutch practice is completely different from what experts in countries without a strong cycling tradition advise. Yes! For me it’s normal to ride my bicycle, being a woman of the Netherlands! I leard cycling from my father when I was six years old and till now I use my bike everyday here in Rotterdam. My bike is trendy, hip with beatiful colours of white and lemongreen. Of course I have two bags of canvas behind, to do all my stuff and grooceries in it. This morning when i cycled home it was slightly raining and I loved it! I came home fresh and fruity! Good condition! Cycling is an awesome booster. I see the happiness in the eyes of parents when they cycling with their baby either in the front or back of them. Great feeling. This again helps in a happy bonding. Thank you for sharing. Yes, you are right: we were taken with my parents when we were babies. We got a little bike when we were two years old, to play in the garden behind. the traffic-rules and we used to bike everyday. On highschool, many years later, I used my bike to go to school, summer and winter, sun and freezing. Still now I don’t have a car, but I use my bike (pollution in Rotterdam is high, so I take my share for better climate) and I like to ride my bike as every-day-booster! I think that it is scary how none of the toddlers have helmets, I always make my 12 year old put a helmet on my toddler. I’m not saying that I think everyone should wear one because by all means my 17, and 12 year old never one and haven’t since they both were 8. 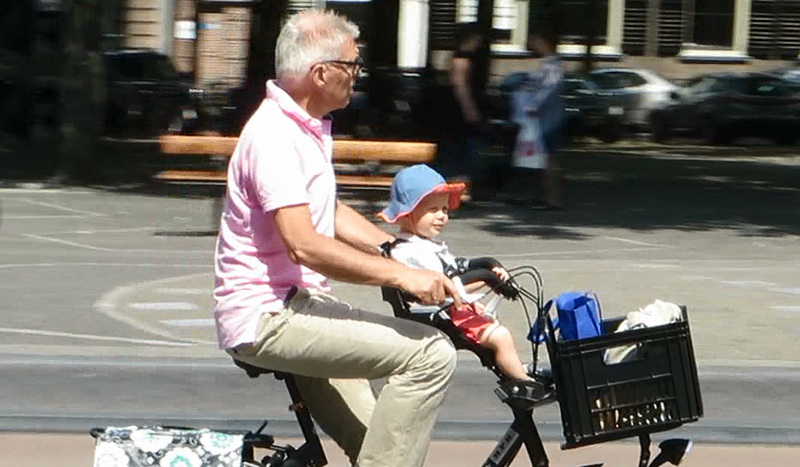 My kids were born and raised in Amsterdam, and I seem to be the only one that believes anyone over 6 should wear a helmet. 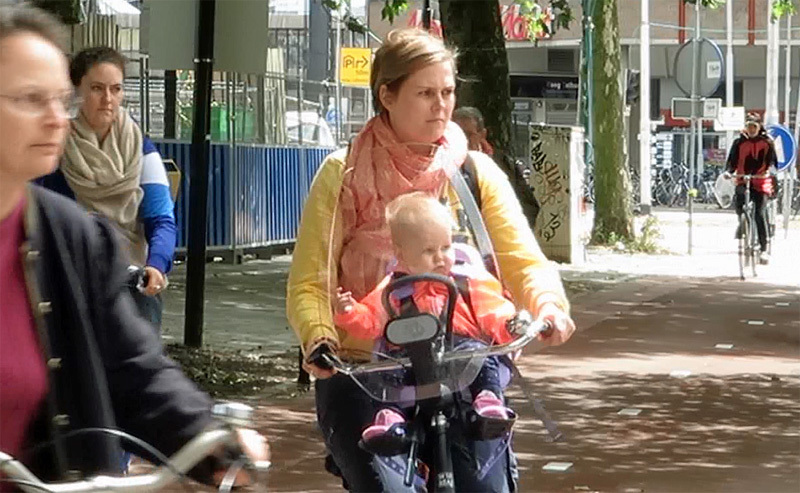 Helmets are not obliged in the Netherlands, but many parents do so although. it is much safer! Our country is almost flat, but the traffic is só crowded, that it should be better. But….I know the mentality of the Dutch (I am one too…) and we don’t like more extra rules. Hi. Where could I rent a bike that can carry my toddler son? We’ll be on holiday in Amsterdam in July. Thanks, Jason. I’ll be following your blog from now now, great stuff! 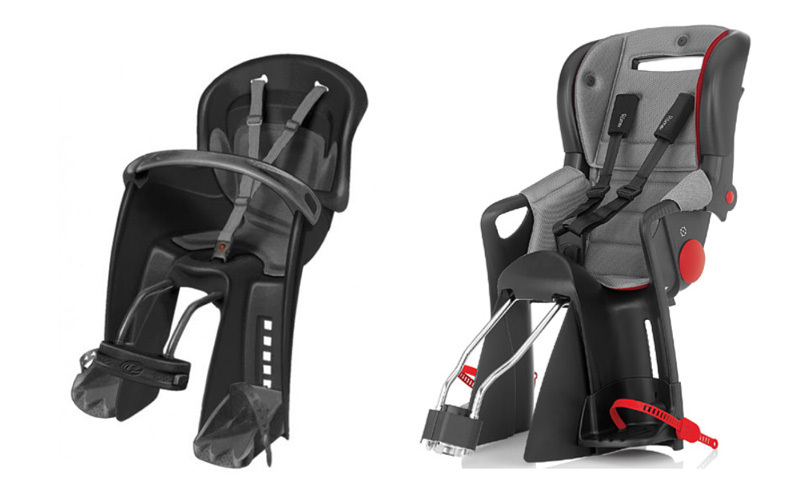 where can I find child seats like these? looking for something simple and one that will not make my bike look like a space ship! Can you point me in the direction of where I can find accessories like this so that I can safely transport my 3.5 year-old? Thank-you very, very much for your article. I like the photos: I would like a simple back seat for her, rear wheel guard so her foot doesn’t inadvertently get stuck in the wheel, foot rest, cargo space and maybe a little handle bar. If we can’t find anything, my husband is going to help me by making parts and welding them. Thank-you. I suppose I should be grateful, they gave me the heads up before they made the report. Well, I’d like to give our whole culture a head SHAKE. How much do you want to bet that when I walk with the kids to school in the winter season, someone will get itchy fingers just DYING to report us to Social Services? But, if I push my 3-year-old to school in a baby stroller with an iPhone in front of her face tomorrow morning, no one will bat an eyelash. [Insert SEETHING grumbles here] So, I will write a nice “thank-you for sharing your concern about bicycle transportation safety with us before calling Child & Family Services” note in my daughter’s parent-teacher communication agenda. I’m not sure if I’ll add “because no one should have to go through the hell of an MSS investigation except those guilty of legitimate cases of neglect” or not. And then, on Saturday, when it is raining, I will take my daughter to the stores and find a bike helmet that fits her PERFECTLY and she can ride in the bicycle trailer until the snow flies. And when the snow flies, we will WALK to school, damn it. The money we save on gas, we will use to buy top notch warm boots, tuques, jackets & mittens and we will WALK. And if they want to report us, I will rip open our jackets and throw off our mittens right in front of them and say: “Come and feel and smell our cozy winter sweat and tell me how I am neglecting my children.” How dare we exhort parents to model active living, get their children off the damn screens etc and proceed to hyper-ventilate because our culture’s addiction to fossil fuel makes small town residential roads apparently UNSAFE for children on bicycles driven by their parents because all the other parents are DRIVING THEIR KIDS to school in CARS to keep them SAFE from other parents driving THEIR kids to school in CARS. WHEN, as a 2-parent working family are our children supposed to be outside? How will my daughter learn to not shove her foot in a moving bicycle wheel if she’s never exposed to the thrill of back seat riding? I think I’ll just sit back now and take this nearly reported incident very personally and blow it way out of proportion. Oh wait; I just did. Thanks for listening. Drops mike. Walks of stage. I have 3 kids. When I lived in Holland, I got a “bakfiets” or “box bike” to take them in. There are many different types, and I’ve even seen some here in New York City. Here’s one place to look: http://www.apartmenttherapy.com/where-to-buy-a-cargo-bike-or-h-150715. And this is the type of Bike I had in Holland: http://www.defietsfabriek.nl/nl/nl/148/model_bf/18/bakfiets_original_long I then moved to this one, http://www.defietsfabriek.nl/nl/nl/147/model_am/22/bakfiets_smart. They are not inexpensive, but they saved me thousand of Euros over the years. I used to have 6 people on one box-bike, me, kids in the front and a 5th kid in the rear. BTW, if you do want your kid to sit on the back of your bike, have them sit side saddle, with both legs on one side. When they cross their feet, it is most comfortable to have the feet far from the spokes. There are options! Don’t give up just yet!! Terrific photos and text on cycling with your young ones. Here is a video of toddlers in Japan being taken home by bike. Note: I recommend skipping the first minute of someone telling you what you are about to see and go straight to seeing it. I feel privileged to live in the Netherlands, riding my recumbent, knowing it’s safe because almost every car driver is also a bicyclist. My three kids went to school by bicycle a.s.a.p. It gave them a great feeling of freedom. Before that they sat in a bicycle trolley behind my recumbent, some road train that was! We’ve always been riding bikes in great numbers, and the ‘need’ for helmets is only a recent one, originating in the US I guess, where safety is a big issue unless guns are concerned. Just too bad that the use of helmets is made into such a big thing and I hope we can withstand this stupid idea. Part of the fun of cycling is being able to hop on your bike as you are. Couple the percentage of Danish kids that already wear helmets with the level of promotion and fear-mongering and it’s not hard to speculate that probably most of these kids will continue to wear helmets into adulthood. The underlying problem is that perceptions can then change when something eventually becomes a majority activity/action. If someday 70 or 80% of Danes all wear one, then it’s much easier to point the fingers at the minority and ask, “why aren’t they wearing one?” If it were all based on self-containing, individual choices that will never influence anything else, that’s one thing. But I’m wiling to bet that ultimately, there will be a shift in mentality if/when such a scenario occurs, both socially and politically. I think it has to do with perception of danger – cycling in the Netherlands doesn’t feel dangerous, unlike in some other places, so there is no need felt to feel safer. The U.S. population has been subjected to propaganda for the past twenty years that made people believe that helmets are needed. Some states it’s required by law regardless of the type of cycling one is doing. It’s crazy. Please do not use the USA as an example of how to ride. Great post. I hope if I ever become a grandfather it will be safe enough in my city to take my grandchild/ren on my bike as you have shown and explained above. When I was a kid (5~6y.o.) visiting family friends, I tried to see if I could touch the spokes of the back wheel with my foot trying to get around the coat/skirt guard while I sat on the back rack. Suddenly my foot got caught in the wheel. Result; completely shattered plastic coat-guard, one broken and two bent spokes and several scuff marks on my leg. The girl that was riding got a good scare. Was surprised how quickly it made the bike stop. I have one memory of riding on the back with my grandmother. Usually we took the bus. This was mid 1980’s in Breda, NL. I had a lot of freedom as a kid to roam the city visiting friends and family on my bike or going by bus all on my own. Even tough the bike infra wasn’t nearly as complete, comfortable and safe as it is now. My niece was 4 y.o. when she started to ride her own bike in traffic, accompanied by an adult. She’s almost eight now. I apparently walked to school on my own when I was 4 y.o. (Was just 300~400M.) My mom only accompanied me the first few days of kindergarten. I do remember sitting in the back seat on her bike when she brought me to daycare/peuterspeelzaal. Are bicycles commonly termed “men’s/women’s” in the NL? I thought they may have been more generically termed “step-through” or similar. I got my Dutch bike with top-tube because it was the last of it’s kind in the country (no more step-throughs were available). It looks cool, but I long for a step-through frame when carrying kids or wearing my suit! On the Dutch Batavus site bikes are categorized as girls, boys, ladies and Gentlemens bikes. Same with Gazelle and Koga. http://www.fietsen.peugeot.nl just shows the bike models and doesn’t mention anything gender related. Yeah they’re commonly called that, but nobody bats an eye if a man uses a ladies’ bike or a woman uses a gentlemen’s bike. I bought a lady´s bike on purpose. I don´t want to yodel when I slip of my pedals. The step-through frame (womens model) is far less stable than the variant with a top tube, although this difference is becoming smaller with more modern frame designs. This entry was posted on 19 May 2015 by Bicycle Dutch in Original posts and tagged children, watching people cycling.